The Christian presence in the Holy Land is declining daily. 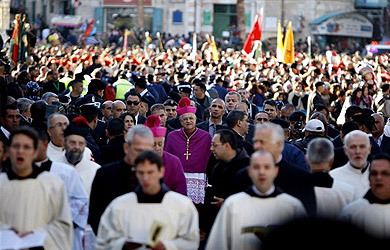 Currently, the Christian community in the Holy Land comprises only two percent of the population. The continued emigration of Palestinian Christians as a result of ongoing instability is having a negative impact on their presence in the land where Jesus was born, crucified and rose from the dead. Should this trend continue, the Holy Land, shared by millions throughout the world, will become nothing more than a museum, as the “living stones” who represent the Christian presence in the Holy Land cease to exist. Prayer to be offered for the intentions of the Christians living and working in the Holy Land. The generation and channelling of the financial resources through the Holy Places Collection and other offerings necessary to provide a sustainable future. Visits and pilgrimages to the sites of the Holy Land to meet with local Christians.